We were the first and are still the best! 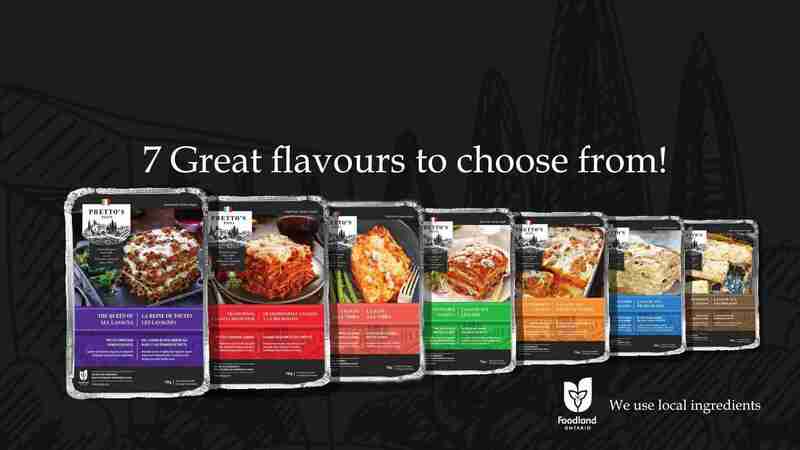 Pretto’s Pasta lasagna has been lovingly crafted in Canada since 1966. Using traditional family recipes, quality ingredients, and specialized equipment, this delicate pasta is made with flour and egg and rolled paper-thin, the old-fashioned way. Made with all natural ingredients and no additives or preservatives. Simple recipes made with local high quality ingredients! After emigrating from Italy, in 1966 Rose and Fred Pretto began crafting the Pretto’s line of frozen pasta. 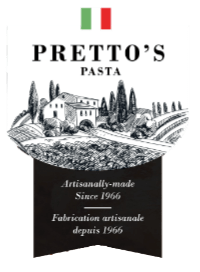 Using traditional recipes, specialized equipment and quality ingredients, Pretto’s was the first to introduce real Italian food to Canadian consumers. Today Winona’s Harvest continues this tradition—making high quality Pretto’s Pasta entrees including classic Italian style lasagna with thin layers of pasta made with eggs and flour. We use locally sourced “real” ingredients—flour, eggs, whole milk, butter, cream, vegetables, crushed tomatoes, herbs and spices. And we do not add colouring or preservatives. Can’t explain how much we enjoy your food! Just tried the butter chicken lasagna tonight. My husband ran back to the grocery store and purchased 3 more, plus a Queen and Veg (which we already loved). Can’t explain how much we enjoy your food! I absolutely have been fan for years of Pretto’s Pasta. To be exact, ‘The Queen of all Lasagna’. I live in Barrie and have travelled to Orillia to buy this lasagna, but the shop I went to no longer sells it. So … last weekend I drove to Hamilton and bought 8 large ‘The Queen of all Lasagna’s, and 1 small Shrimp lasagna to try. I love this company and their products! Please try and bring back this product back to Barrie, or close to. Your product is all quality, and delicious. I don’t feel I ever been so passionate about a product I love so much. Best Lasagna in town. Taste like homemade lasagna! Obviously home-cooked. The taste is pure, rich, and real. We can pronounce and recognize all of the ingredients, which there are likely 5-7. Well done, guys! You have this busy mom’s business! I definitely will be stocking my freezer for those crazy days I struggle to get dinner on the table. Thank you for making REAL food, with real ingredients that our bodies will recognize as food and nourishment. Wow, just tried the Butter Chicken Lasagna. Simply amazing! I already loved the veg lasagna with the béchamel sauce, and the Traditional lasagna … this is the best lasagna I have ever had, keep up the great work. Could never duplicate this great product. Nicely done! I brought 3 different varieties of this lasagna to my last big family gathering and everyone loved them. The traditional style in which they are made, with many layers of thin pasta, makes this lasagna stand out from the crowd.